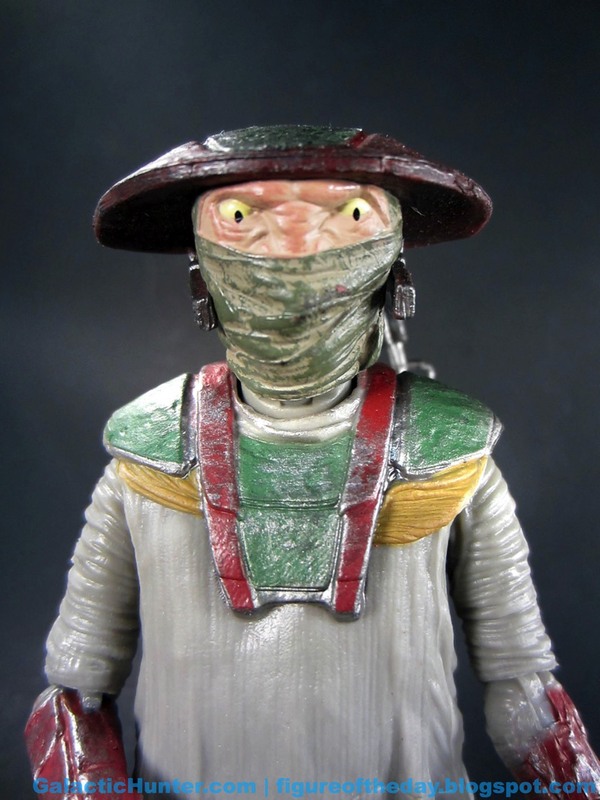 Commentary: Appearing in 6-inch plastic around the same time as 3 3/4-inch, the big Constable Zuvio seems to be cut from the same reference files. As I write this, I don't know for a fact what his deal is but I've heard rumors about him being important in the first part of the movie and he enables a jumping-off point of the story. We'll see! Right now al I know is that he's short, with a flat face, and a great hat. Oh, and pretty nifty articulation - the ways they hide the wrists are clever. 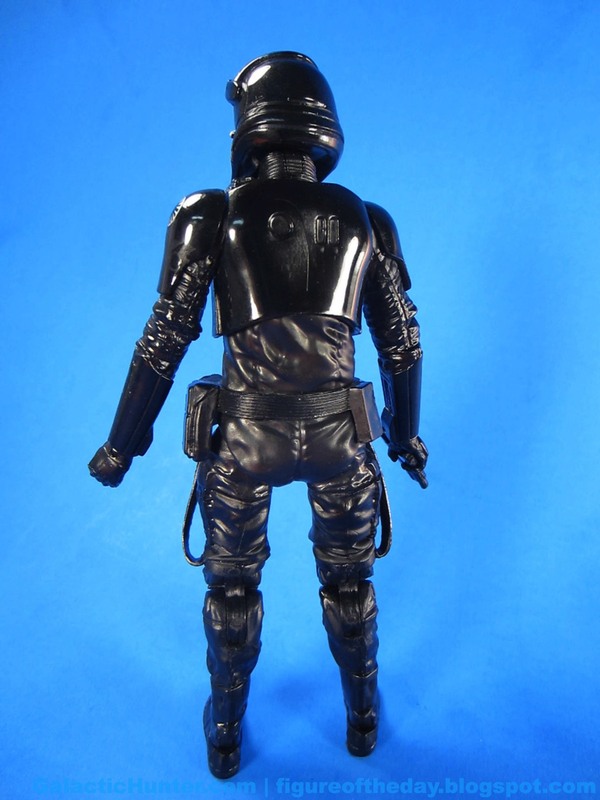 The bend-and-swivel joints are hidden behind the wrist armor, meaning you can get some decent poses out of the officer who literally brought a knife to a gun fight. Maybe it shoots - I don't know, I don't see a trigger. His costume is really impressive. 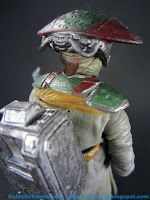 The weathering on his hat is some of Hasbro's finest work in any action figure line, and the "hard" bits are similarly impressive - silver and dark brown markings make it look like it has seen plenty of wear, and seeing these techniques applied to future figures or redecos of figures (Fett, Boba) could result in some of the most spectacular things we've ever seen. The face is pretty good - mine has cast-down eyes and that could be either intentional or bad paint masking. I'm not sure which. Hints of rust peek from the head-mounted (I assume) microphones or breathing gizmos, and the sculpting on his blade shows evidence of a lot of beating. This is clearly a design that had some time put into it, but the gorgeous, battered armor does clash a bit with the fairly not-worn and hole-free shirt. It does, however, have a lot of dirt as we move near the fly of his pants, so... I'll refrain from making that joke. Again, it does show a dedication to diligence with paint because I don't know that I have a better-painted figure from Hasbro this year. His backpack is so worn that it looks like he got it from a thrift store after it was buried in the back yard for 30 years. It's just amazing to see what Hasbro is trying these days - I hope it's true to the movie! I have no way of knowing! You're in the future! 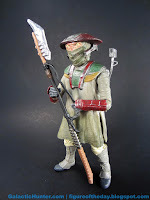 Articulation is better than average for this line, but only barely - most figures have the exact same articulation as Zuvio but more restrictions. The constable's elbows get a nice 90-degree angle, but his hips are restricted by his shirt. I'm currently operating under the assumption that this figure will not get a vehicle at this scale, so I'm not going to whine about it - instead, it's easier to just admire him for being able to stand on my desk and not wobble as I type with my massively powerful meat mitts. Stability is an admirable feature on toys whose sole purpose are to be displayed, so hey Hasbro - nice job here! It looks good and it stands. That's most of what we need in a figure. With The Phantom Menace I had a pretty good idea who most of the toys were when they showed up in the store. For this movie, I don't know - it's weird that I've spent a decent amount of sweat acquiring characters for a movie I may love and I may never want to see again. We'll see. Even if Zuvio spits out fart jokes and sounds like Ed Wynn, the figure is superb in its own right. Any failings are no fault of Hasbro's. 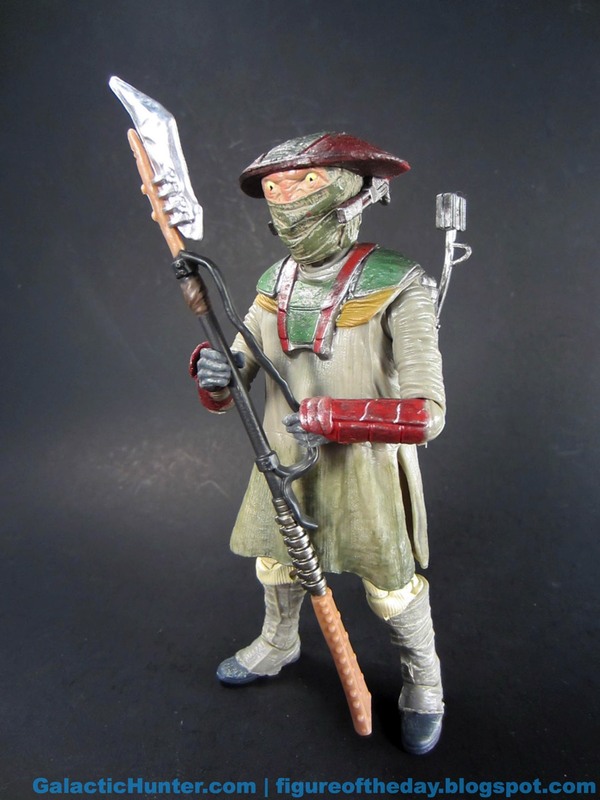 Get it if you think you might like a Zuvio toy, and cross your fingers the movie didn't change his design too much. ...and I need a break. There aren't many figures in here that I didn't tackle yet - but at this point I think it's getting pretty ridiculous to keep this going without, you know, seeing the movie. I'll see you in a few weeks! CAPTAIN PHASMA Your Mom Will Say "Phantasma"
Commentary: The world is changing! 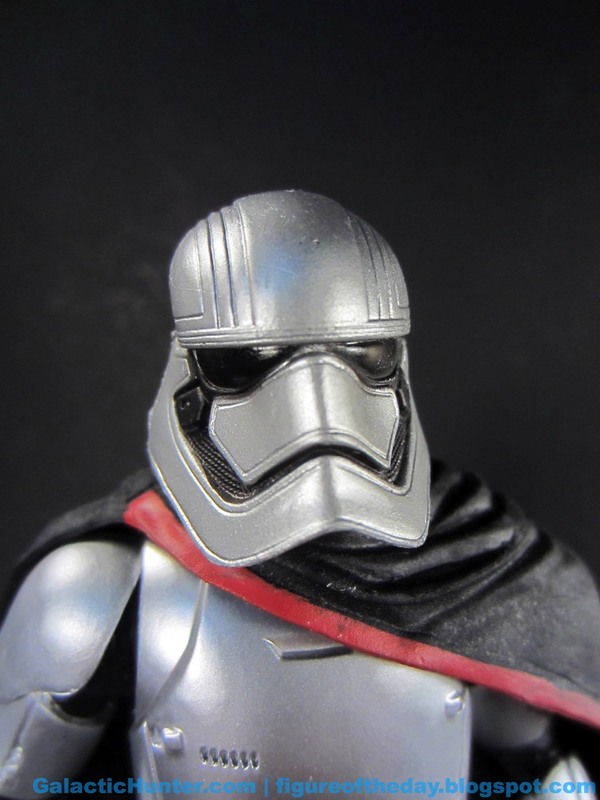 One of the most sought-after figures in the line - despite knowing nothing about her - is Captain Phasma. 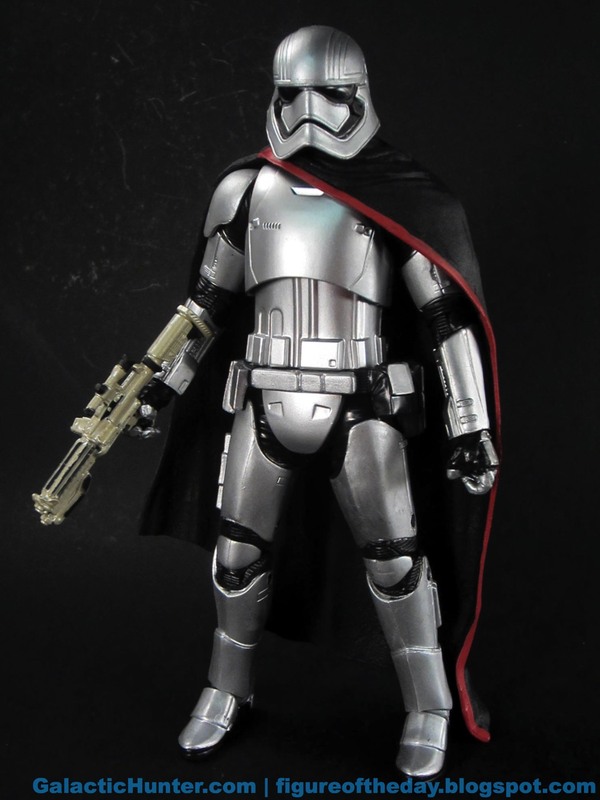 She might only be in the movie for 30 seconds, but nobody cares - chrome stormtrooper? Yes, please! This is the kind of thing that gets people excited, plus it's another entry to the positively tiny club of women in Star Wars that have a speaking role. Granted, some will argue "it doesn't count!" because she's covered in armor but I disagree - adding women to the stable of armored badasses in the series is a good thing for all involved. Nobody goes around saying Metroid's Samus Aran doesn't count because she's dressed like a cyborg. Her blaster fits securely in her hand or plugs in to her thigh, and the red-trimmed black cape looks pretty snazzy. Hasbro did a bang-up job delivering a figure that's absolutely gorgeous in the packaging, but once you open it it offers little new and isn't as good as it could be in terms of articulation. If you're making a small, cheap figure articulation is arguably less important - but at this scale, and the audience of older collectors, it'd be nice if she could easily and non-awkwardly carry her blaster in two hands. None of this matters, of course, because people are running out to buy her, overpaying on Amazon, and ultimately this is a toy that will sell no matter what. Fans love new armored dudes - and now dudettes - so odds are Phasma's ability to sell will continue for years to come. 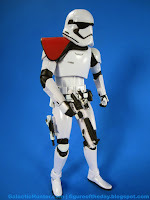 Commentary: This is the third take on this particular trooper in this scale, but the first 6-inch one to sport a white pauldron. 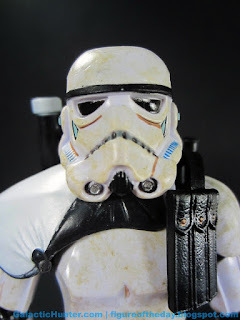 Sandtrooper Sergeant figures are a repaint of the very first Sandtrooper way back from 2003, but with a white shoulder pad and different dirt. Other than that? It's pretty much the same thing. 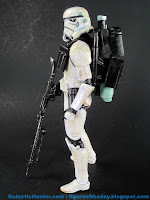 There are multiple flavors of Sandtrooper, so "building an army" is a little more interesting with this figure than a plain white Stormtrooper - you can get a little more variety on your shelf, and odds are you won't have to ask "Hey... do I already have this one?" The sarge is often seen riding a Dewback and I still hope we'll get a 6-inch hairy lizard at some point down the road. (Insert giggles here.) 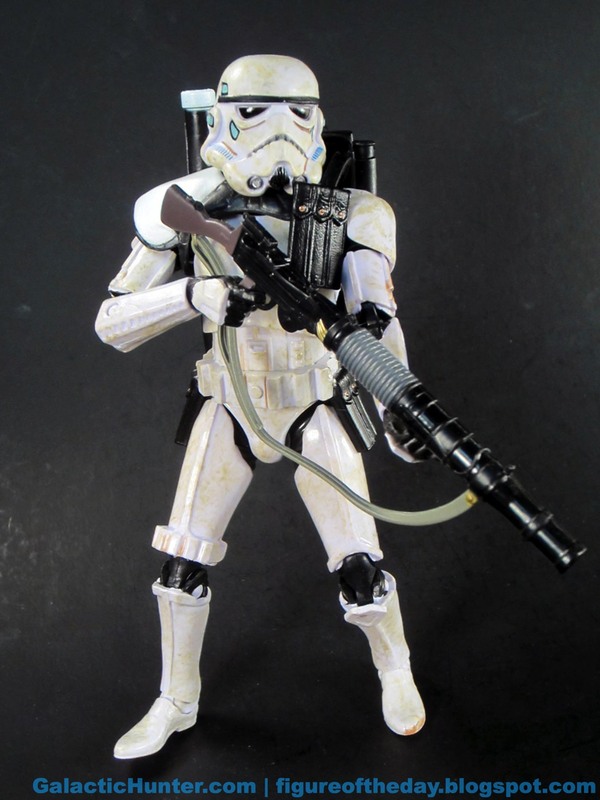 The weapons are the same as the other figures, and so is the mold - but you'll notice some alterations on the weapons, like a silver mark on the Stormtrooper blaster and a different level of deco on the rifle. 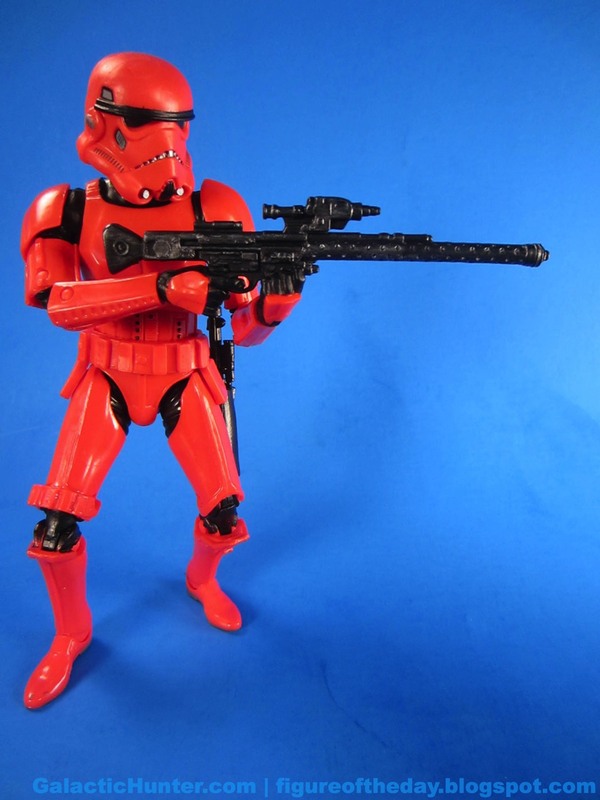 The grenade launcher isn't really all that different, but the deco on the armor shows signs of improvement. Due to how the figure is painted, earlier ones had more pronounced brown smears next to perfectly clean white areas - the jokes write themselves. While there are still some dark brown dirt spots, they seem a little more accidental - like maybe this is where the guy got pelted with some sand, rather than this is where the paint job went wrong. Mine even has some dark stuff on the bottom of the shoe, which I find to be delightful. 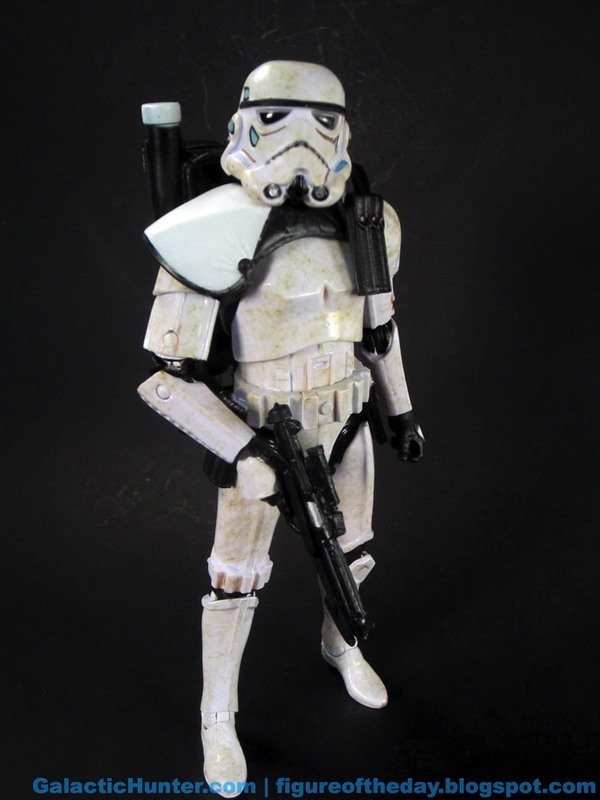 Depending on your Sandtrooper needs, this is skippable or a must-buy. 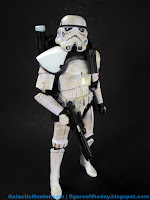 If you only need one Sandtrooper, this one isn't going to change the world - it's an improvement in terms of mud distribution but as far as engineering and his weapons? It's not a heck of a lot different, but it's different enough to be interesting and it was something on my list of variations that seemed essential in the near term. 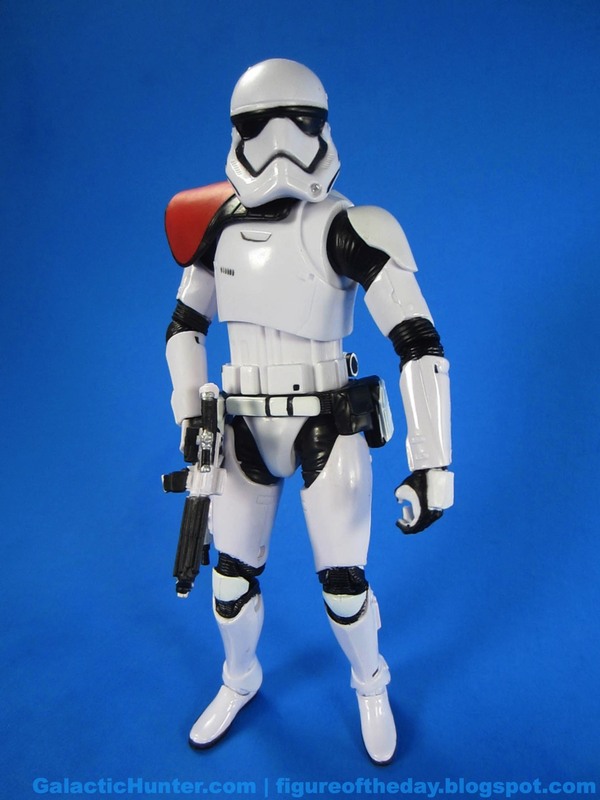 Plus I really can't get enough of the Stormtrooper mold, even if I've now got something like eight troopers based on the buck. And I'll buy more if they make them. Collector's Notes: I got mine from Entertainment Earth. I also work there. Commentary: What's so funny about peace, R2-Q5, and understanding? Tradition! 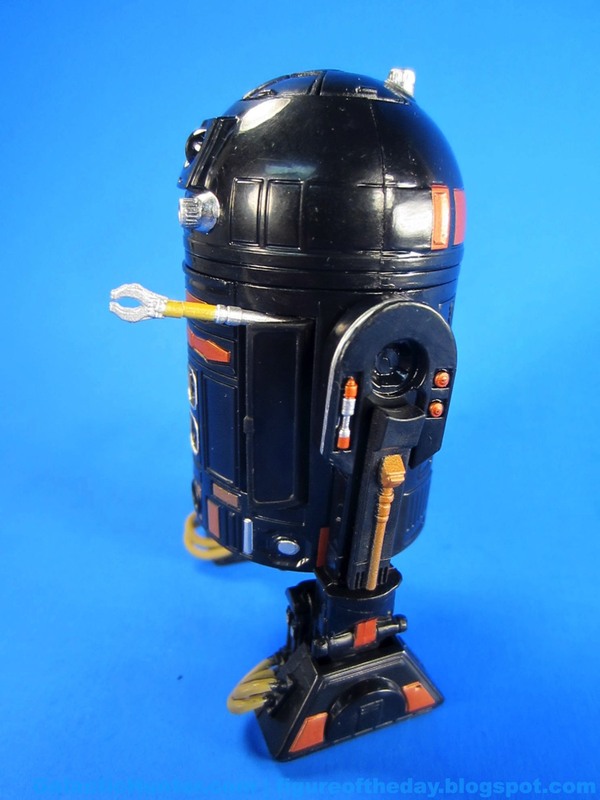 The first original trilogy-based "repaint" (it wasn't) of R2-D2 didn't come until after the first prequel - we had R5-D4, R2-R9, R2-A6, and R2-B1 but the only proper round-domed original trilogy droid figure was R2-D2 until 2001. 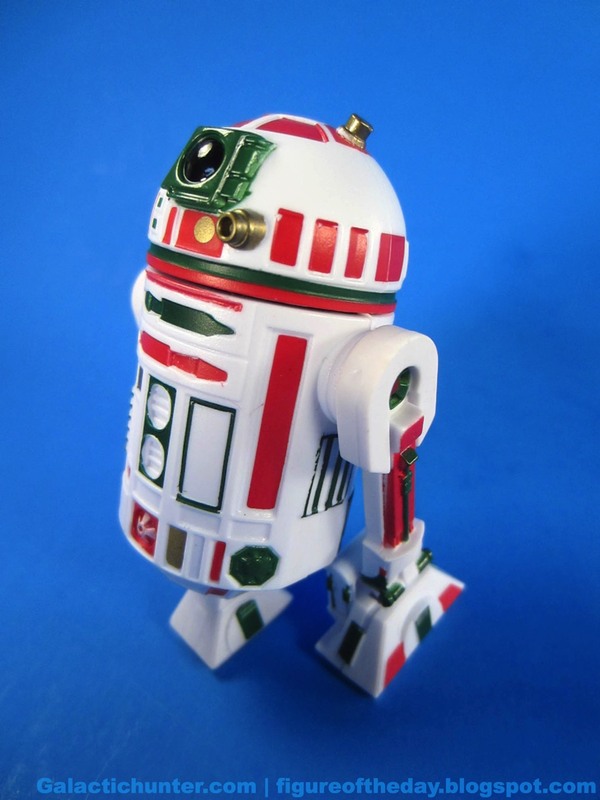 What more appropriate figure could there be to kick off the 6-inch scale R2-D2 repaints? I couldn't think of a better choice. 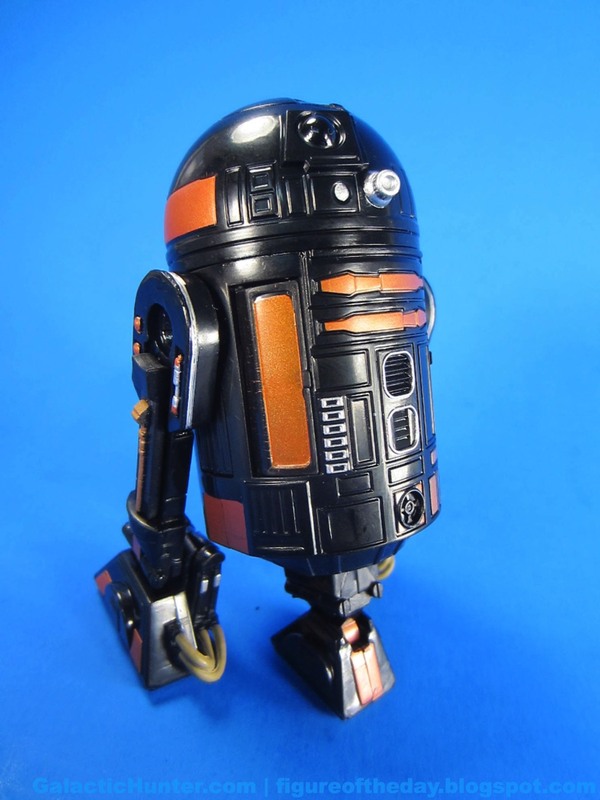 After all, the first law of toys is that you always make a black repaint. 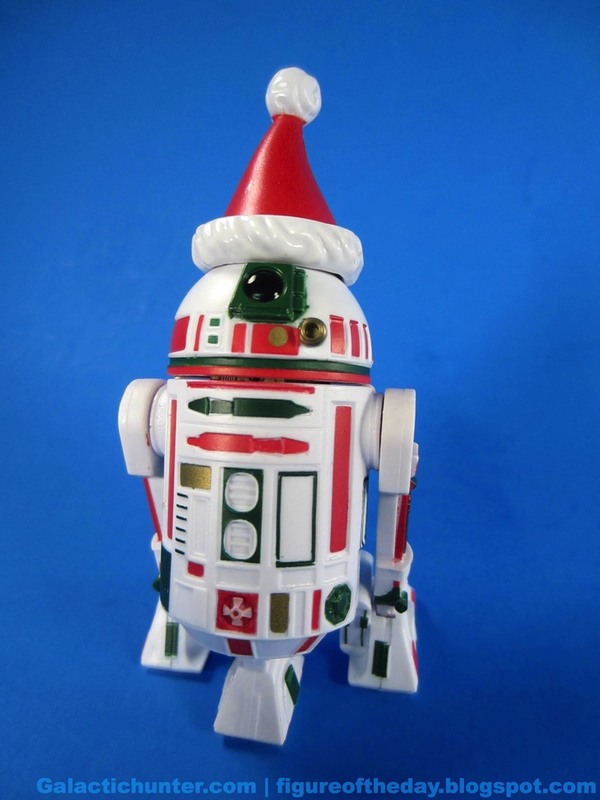 Kids love those and deserve their dark, brooding R2-D2s. And you needed another Imperial guy for the set, so here it is. If you know anything about me, you know this is one of the first thing I ask for. What's that? An interesting R2-D2 mold? Let's repaint it! 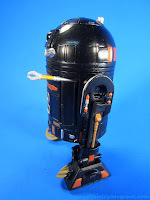 I mean, if I see a blue droid I want to paint it black. The deco is a bit truer to the recent release at Disney parks, but is even closer to the actual movie photos we're seeing. The black is very glossy, the central vents on the chest are outlined in silver, and the painted panels are, to say the least, vibrant. What's more, the opening panels reveal arms that are actually painted. I don't mean just painted silver, either - the claw arm has a gold trimming, while the other arm has some added grey. Admittedly, it may not make up for the loss of the various sensors and scopes (or the lightsaber from R2-D2) but it's certainly a nice surprise I wasn't expecting. Obviously this is not a $100 high-end replica, but for the asking price I'm pretty stoked with this little guy. 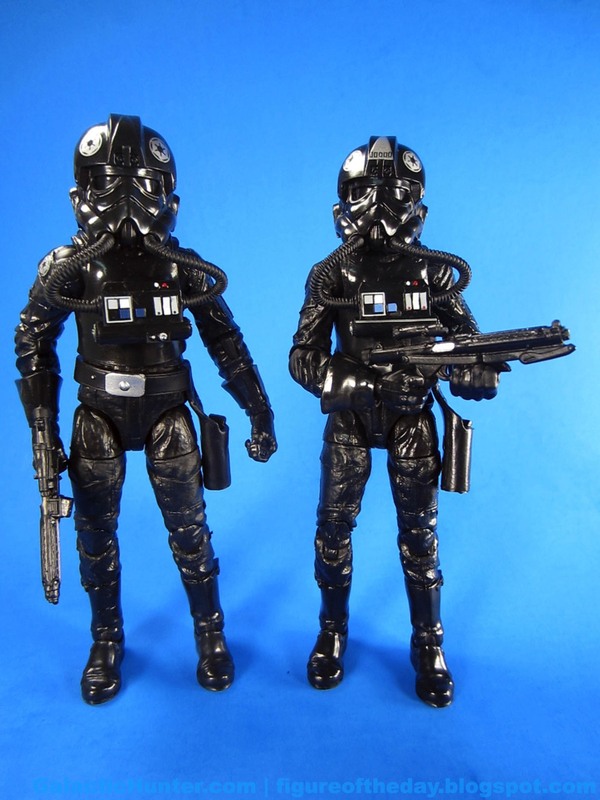 The Empire has been getting a lot of figures in the 6-inch line so far, and I'm hoping it gets more - figures like this keep things interesting while Hasbro has to balance redeco concerns with all-new figures. 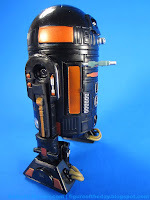 If you're going to have to do a repaint, repaint a droid. It'll make me happy, every time. 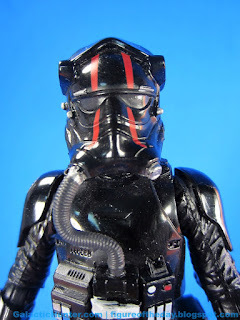 Commentary: Complete with red stripes, the First Order TIE Fighter Pilot marks the debut of this mold - a black version is expected in regular $20 packaging any day now. This one has unique markings, and costs a lot more, and takes up a lot more room once you get the TIE Fighter - itself bulkier than that Imperial Shuttle that your parents didn't love enough to buy you when it was on Red Tag Special at Lionel PlayWorld in 1985. Toys of this size spark the imagination and bragging rights, while simultaneously making you question your devotion to your hobby. One of these toys is enough to require you reorganize your office or home collecting space. Odds are Hasbro won't stop here - and odds are they wouldn't be satisfied to keep things at smaller sizes like Dewbacks and Landspeeders, either. Hasbro's initiative to include a unique figure with vehicles will also test your ability to stay your definition of "all in," if you still are - my TIE is so big that its wings block out light in much of the room that my vehicles live in right now. 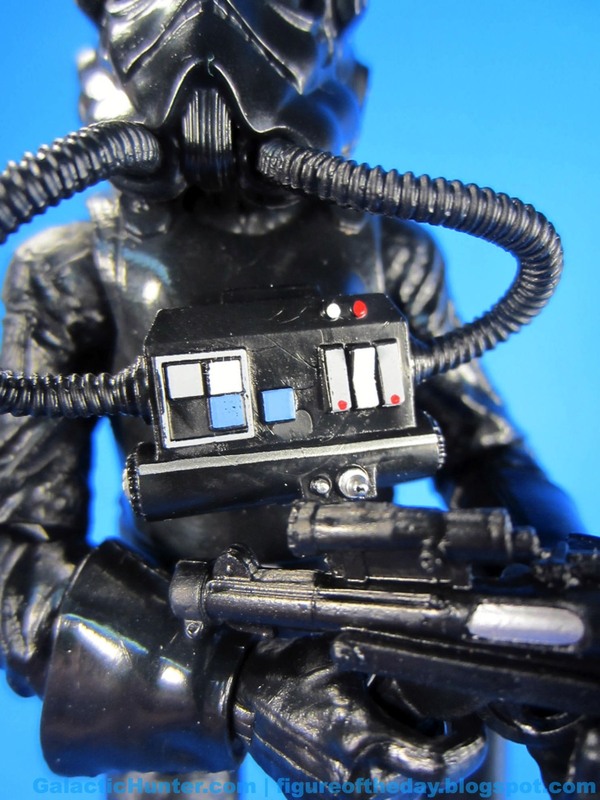 In some respects, Hasbro's grab for higher-dollar collectibles and the level of impressiveness we've clamored for since 1995 could be our undoing in fairly short order. The figure itself is about as good as anything else in this line - although (and I can't believe I'm saying this) the 3 3/4-inch package is more fun. After all, the smaller TIE and pilot has gun storage and firing rockets - the large one is a tedious (but gorgeous) craft with the most beautiful interior I've ever seen in an action figure toy. It's also damn near impossible to fit the figure in there - I could not seat the figure inside without dismantling the seating and removing parts with a screwdriver. Perhaps your fingers are more nimble. This is no critique of the figure, but figure/vehicle compatibility has been a recurring problem since the 1995 relaunch and I don't get the feeling these things were fully tested. 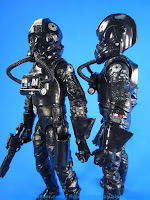 As a figure unto itself, you're going to like the TIE Pilot. Of course you will - you always have. Now it integrates elements of other figures, which adds to the charm. His blaster design looks a lot more like the original 1982 Kenner figure's (incorrect) weapon, and the back of his armor has the famous Stormtrooper "OII" markings. 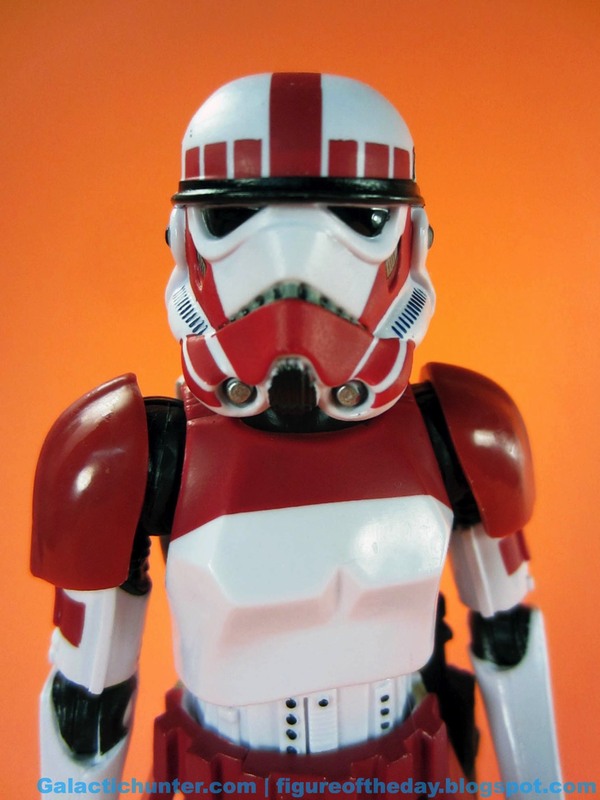 Shoulders feature the First Order symbol, while the rest of the figure is a mishmash of elements remixed from previous pilots - the red stripes may be familiar to fans of the Expanded Universe, while the helmet's one tube and smaller chest components feature fewer, smaller switches than the "old" original. The suit fits quite well, but seems more armored than before - take note of the forearms being covered, and the shoulders too. 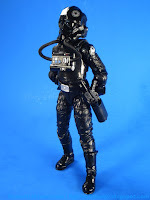 This gives the figure an even more militaristic look when compared to the original TIE Fighter, whose only real armor was on the head and chest. 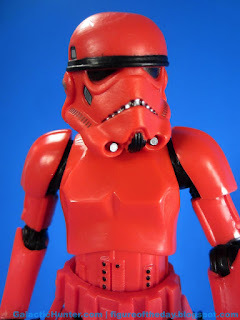 The quality of the paint is on par with Hasbro's better efforts, with glossy "plastic" and more matte "cloth" elements - but it all shines a bit. 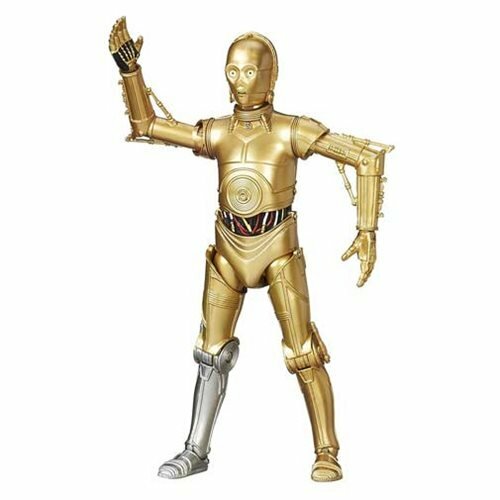 Articulation is similarly on par with other figures - single-jointed elbows, double-jointed knees, and rocker ankles. I had to have him basically "kneel" to fit in the TIE Fighter, but he does fit and does look awesome through the cockpit's glass. His movement is a little bit better than his Stormtrooper companions, but I'd be lying to you if I said the belt and straps didn't get in the way of the hip movement. 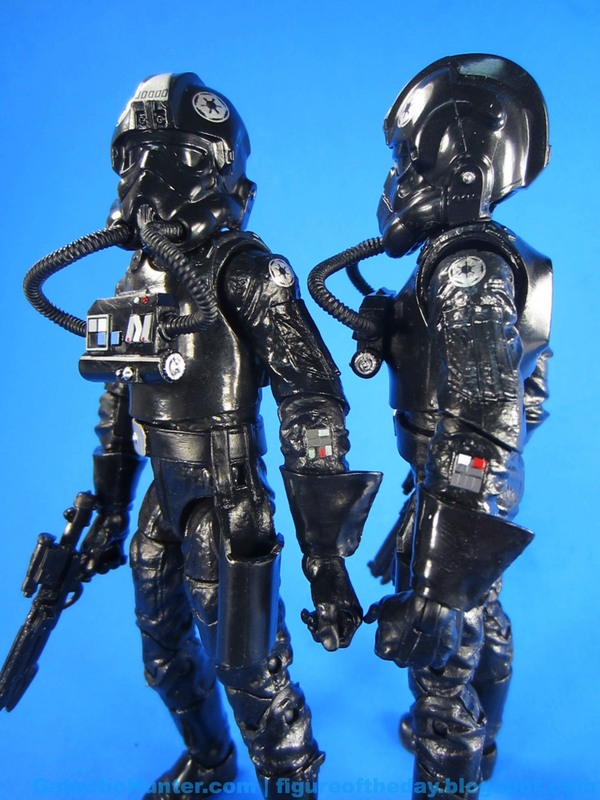 As a TIE Fighter with pilot - assuming the two were never meant to interact - this is a wonderful set. I don't believe any figure should require this much fidgeting and fudging to fit in his vehicle, mostly because it wasn't a problem for any toy that I can recall from my toy box in the 1980s. Figures fit, period. 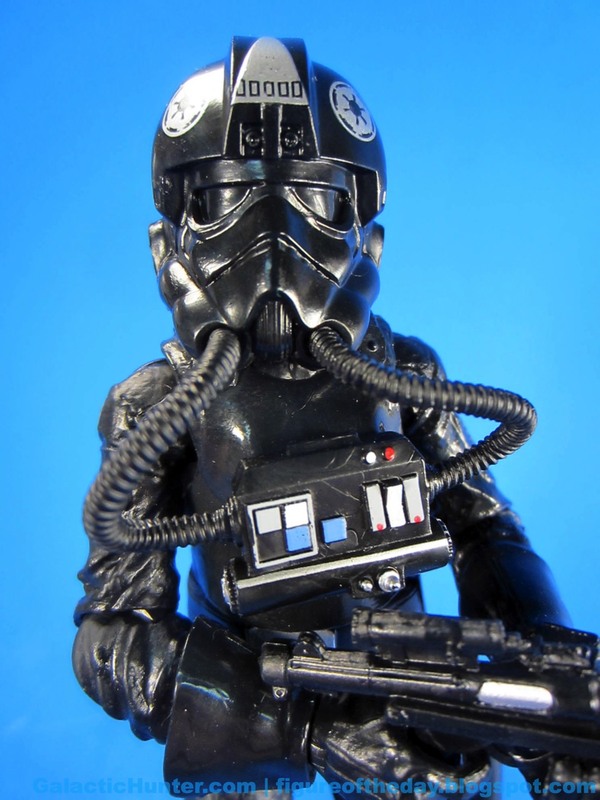 This TIE Pilot will look great on your shelf - which is where you may as well keep him, because really, why bother hiding it in the vehicle anyway? Unquestionably not worth the asking price of the whole set unless you really want the TIE (and despite its problems, I still do) but perhaps a clearance sale will flush these out of brick and mortar in the next few months - maybe. Then again, maybe so will the movie. Collector's Notes: I got mine from Entertainment Earth, and so far I've seen them online, at Target, and mostly at Toys R Us. Commentary: Who is Lt. Oxixo? I got asked this a bunch - if you're OT orthodox (read: ignored the writings of the late 1980s and 1990s) he's nobody - but if you followed the RPGs and CCGs and later Hasbro figures, he's another pilot. 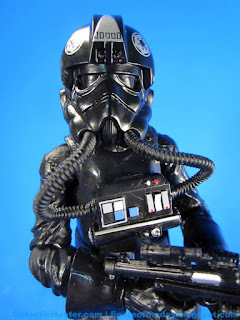 I couldn't place him in the movies from memory - Hasbro placed him at the Battle of Endor in 2011, and I get to experience memory failure as I would've bet money he was in the Decipher CCG - but dang if I can find him on any of the lists! Hooray, failing memory. I can find Mauler Mithel, though, so what I'm saying is this: don't get old. 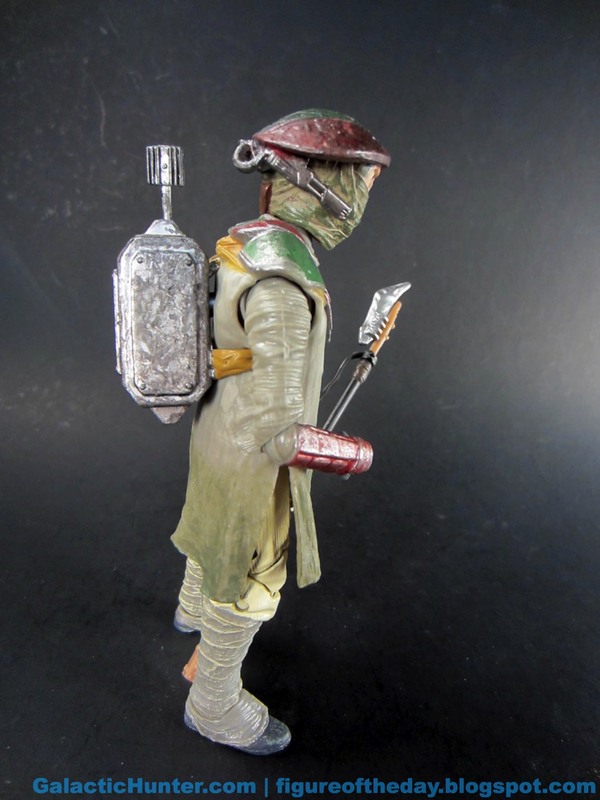 Hasbro sold him as part of an Endor set originally, but the helmet design is - I believe - only seen in the original Star Wars. Correct me if I'm wrong, I'm not the expert I thought I was on the TIE Helmets because this one got by me and my CCG memory. As to why - because he was there! And there were only so many molds to redecorate and tweak at the time this went in to development. So, what's special here? The helmet! Also the chest and the buttons on his sleeve. 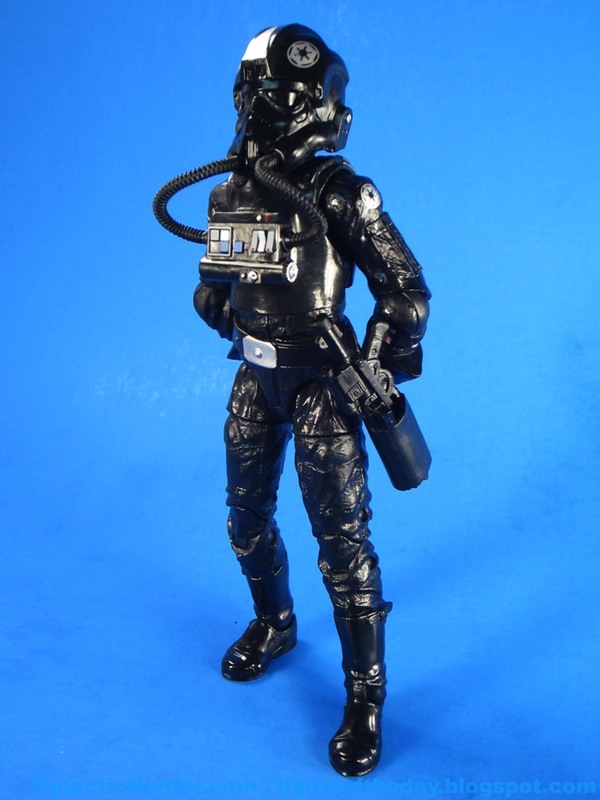 TIE fighter pilots don't have a lot of variation in their costuming - there's a lot of black and, on the whole, the various helmet decorations were left unchecked for ages. Nobody in the 1990s was clamoring for any variant helmet deco, but eventually Hasbro started adding the various stripes or slight tweaks (or removals) of certain elements. 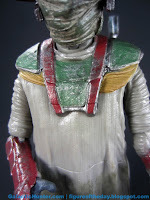 Oxixo has a big silver mark on the front of his helmet with little black boxes at the bottom of the border, an added silver stripe on the tube at the bottom of his chest panel, remixed button deco on his left sleeve, and some red indicator lights on his chest switches. There's even an added silver mark on his blaster. Articulation is the same as the standard version from last year which gives you about 20 joints. He's great - the elbows move fairly well, you get bend-and-swivel elbows, and of course you're given double-jointed knees. A working holster stores the blaster if you're so inclined, but I'd rather have it visible so you can see the unique marking. It's not much, but hey, it's something. Collector's Notes: I got mine from Entertainment Earth. I also work there. You really shouldn't listen to my biased opinions about this exclusive, I'm very happy with it. 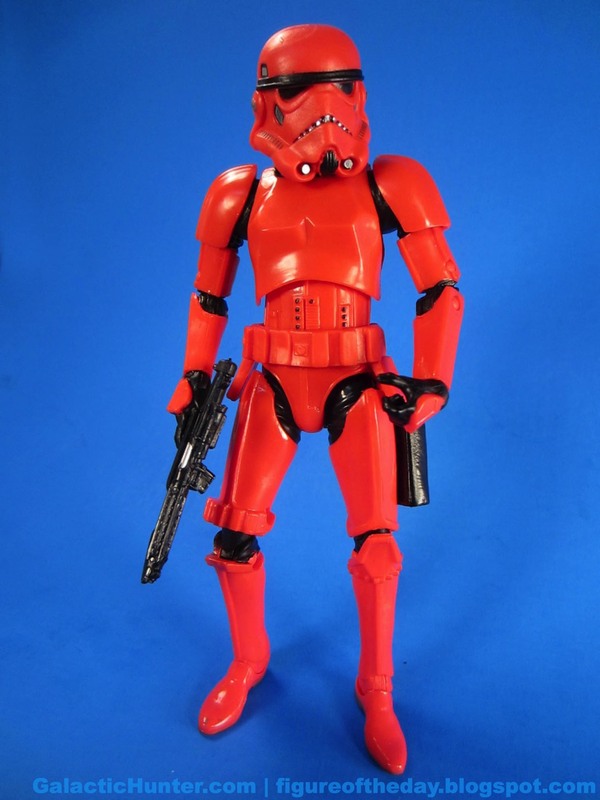 There are very few strains of pre-prequel colorful Stormtroopers as of yet untapped by manufacturers, but they do exist - so seeing things like this one make me pretty happy. 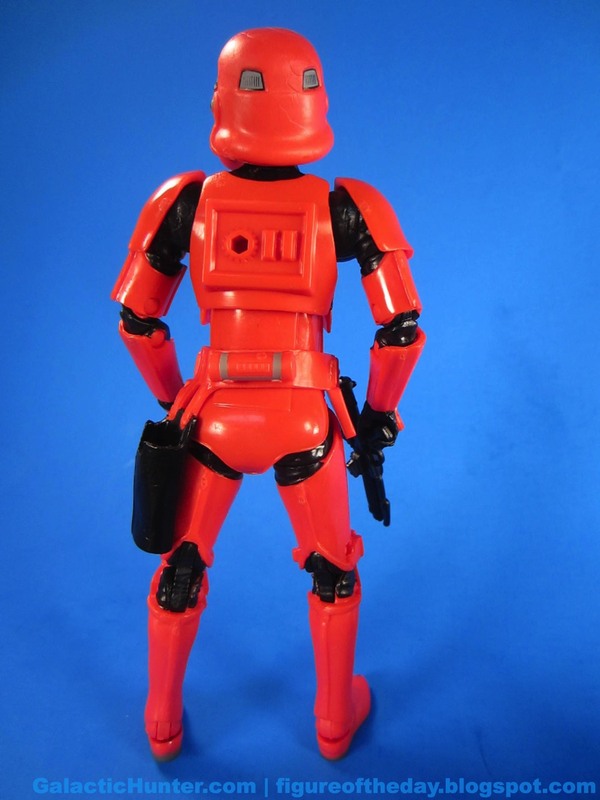 The figure is a pretty solid red, complete with the appropriate markings. There are grey bits on the helmet and belt grenade. 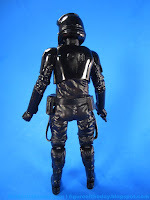 Black elements representing the body suit and holster are present as well. 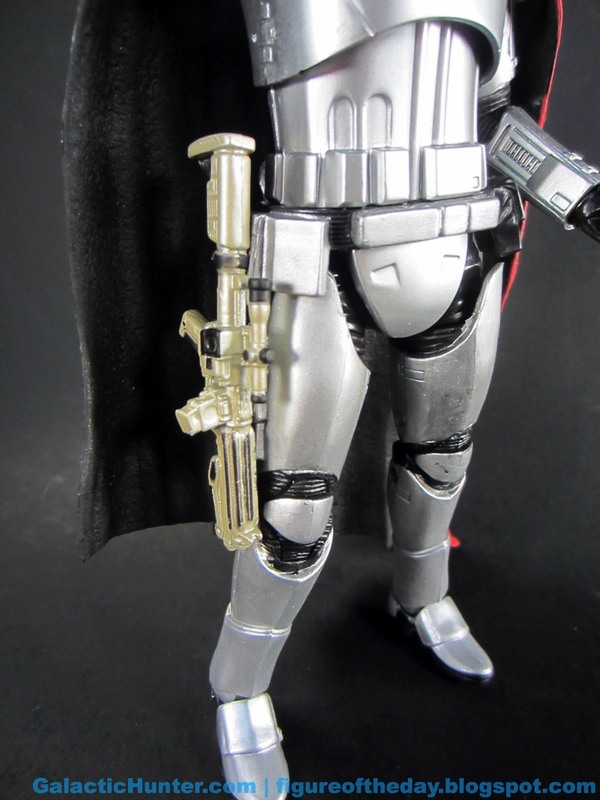 If that weren't enough, there's a tiny bit of silver on the "teeth," the side of the smaller blaster, and covering the rifle as faux weathering. In other words, it's pretty much as good as the regular Stormtroopers. 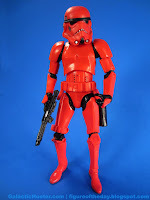 Other than Gentle Giant's Magma Stormtrooper statue, any sort of all-red Stormtrooper has been pretty much nonexistent as toys and collectibles go. When it comes to movie-based variations on the classic Stormtrooper, blaster damage and grass stains can only take you so far - seeing things like the Battlefront Shock Trooper and this Crimson Stormtrooper help to expand the galaxy a bit more before we see what I assume will be many flavors in the various spin-off movies. 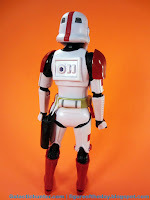 I'm stoked Hasbro used the existing (and fairly good) mold with double-jointed elbows and knees, mostly because it seems they're slowly phasing those out of their 6-inch figures with each new design. At this point I'm just hoping they make a 3 3/4-inch one too, mostly because I still see that as the figure line of record - and we're missing a few other, larger (and smaller) figures in that scale still. Commentary: What a difference a few months make! 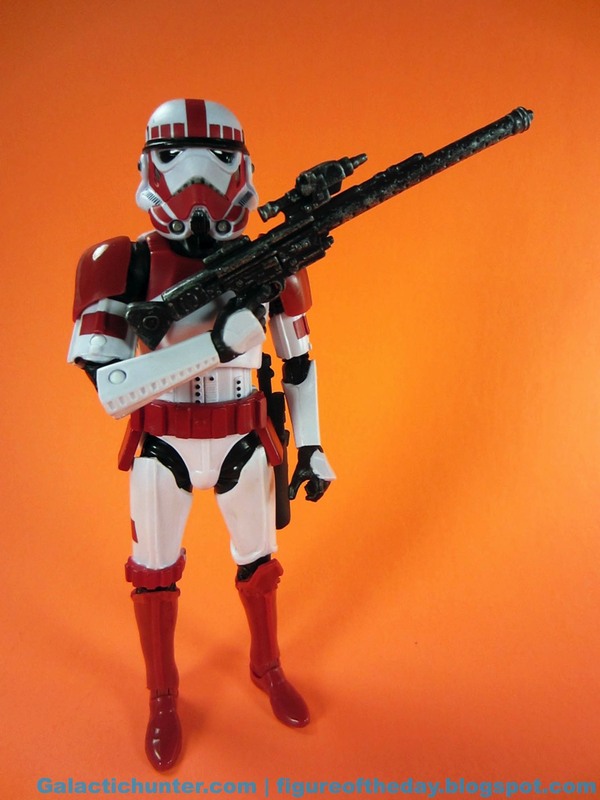 A few months ago we were freaking out over a first-look package variant of this trooper. But now, the First Order Stormtrooper Officer marks the third release of the mold, and it's arguably the best one. Why? Because if you want an officer, he's got the shoulder pad. 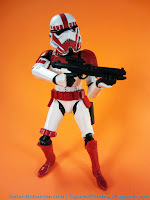 If you don't, you can pop off his head and remove it - and presto, you've got a trooper. 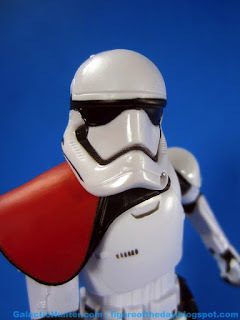 So, that's you're selling point - new shoulder pad. Otherwise, it's the same as the release from SDCC which got repackaged and sold to all in September. 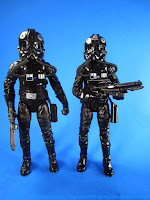 While it's a pretty nifty figure, the elbows are still restricted in their movement and unless you're making a diorama, you probably won't want more than one or two of these. If you only get one 6-inch Stormtrooper from this movie, an officer makes the most sense just because he grants you added options. Also, thanks to a recent TV spot we know for sure that these costumes exist and will appear in the movie. I like the base figure - but I don't love it, it's not as good as most of the 6-inch figures we've already been sold. Granted, if he's just going to stand around anyway you don't need him to do a whole heck of a lot. Commentary: Jedi Mickey happened on Lucas' watch, so R2-H15 isn't really all that weird. The name (Holiday 2015) tells you its function, with the hat and colors alluding to the fact that this is a Christmas souvenir. 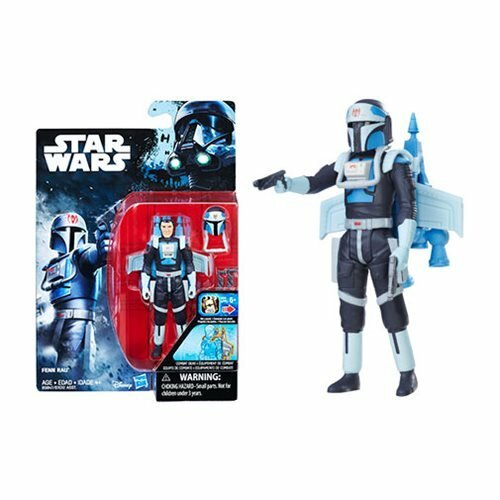 His packaging copy goes out of its way to say "winter" while not actually telling you a single thing about the robot's function - is he from Ilum, Starkiller Base, Hoth, or some other snowy world? From which faction does he come? And where did he get that swell hat? The figure is plain white plastic with green, red, and gold highlights. 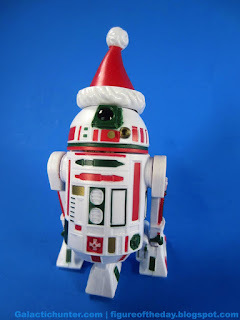 You've seen white domes on Disney droids before, so this isn't entirely new - but it is unique in that you probably don't have many of these. He looks a little bit like a snowman, albeit with much more decoration. 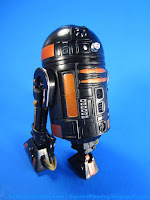 His backside is notable in that it's loaded with paint - often Hasbro makes a figure with a plain white back, while R2-H15 seems to have been given the droid equivalent of an ugly sweater. Big red and gold panels - gold gold, like, metallic - are lines with green borders to draw in your eye. 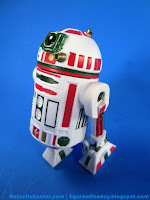 Even the bottom of the figure has red and white panels, looking something like the robot equivalent of a candy cane. It's almost nightmarishly festive. The hat is cute, but mine has a little ding in the red part. It's metallic, sparkly red with hints of violet when the light hits it just right. The ball on top has a swirl, which I first assumed might be a little Death Star. (It's not.) 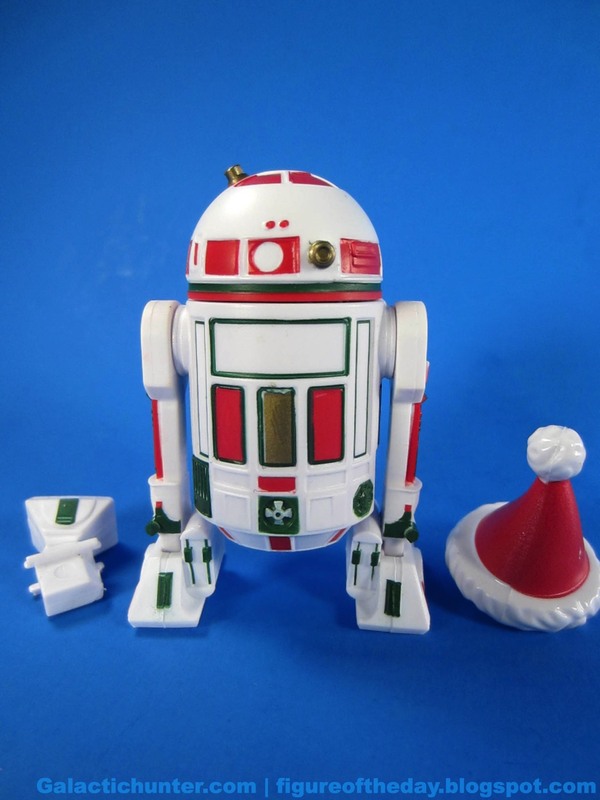 It's a nice little accessory for the figure, although it might be going into a box unless R2-H15 goes into a holiday figure display with the Jawas, R2-D2, C-3PO, Red Vader, and so on. I like it. It's new enough to be interesting with a newly tooled hat and deco unlike anything I've got in my Star Wars toy box. 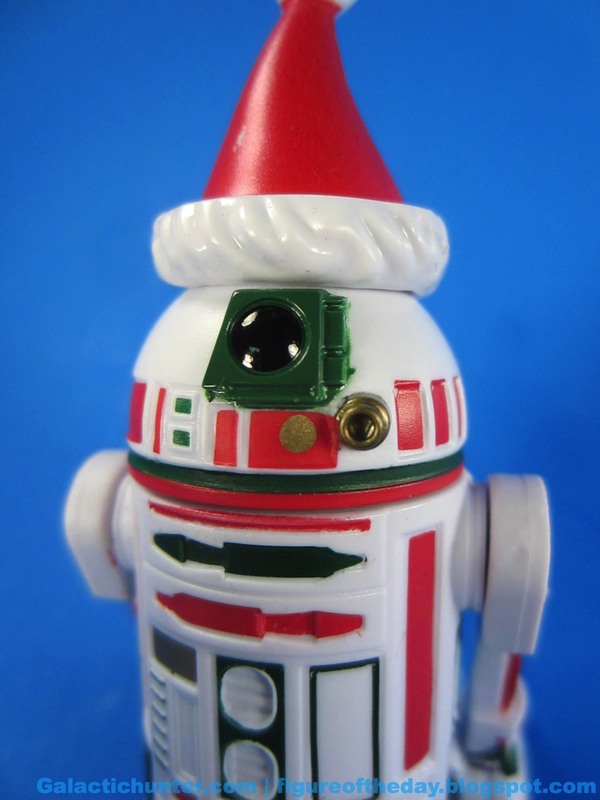 I won't say that you're guaranteed to love it, but if you're droid crazy like me you probably are just thrilled that it's a new figure with a new name and not R2-D2 with a new hat. If you have the means, get this one - it's pretty cool. 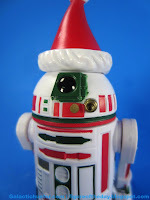 Collector's Notes: Special thanks to Awesome Toy Blog's Matt Guzy for picking me up a sample at Disneyland! Commentary: I haven't had to do a lot of pound-the-ground toy hunting in quite some time - these days (as an employee of the world's finest Internet toy collector store) I just get things online. It works pretty well, but we don't get all the exclusives - so I had to make a map and spend a few hours locating a Imperial Shock Trooper. Oh sure, the store locators said they were in stock, but "in stock" does not mean "on shelf." More hunting was necessary, and much gas was wasted, and dinner was delayed. (On the bright side, fellow citizens of Phoenix, the Toyko Express on Indian School is quite delightful.) 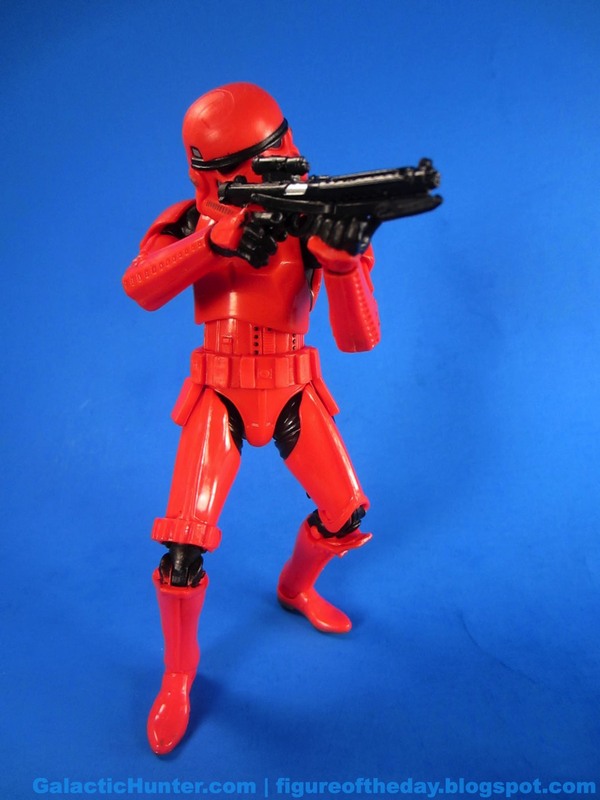 Was it worth going around for a red Stormtrooper that's not as red as the one we're selling at work? I'd say it was. 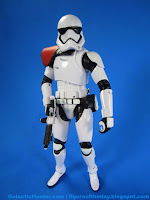 If you have a white Stormtrooper, you know what to expect here - a figure that is, without question, more interesting than the ones we're getting for the new movie. 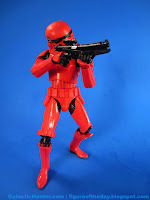 They aren't bad as such, but the new line lacks double-jointed elbows that so many of us crave - so even though this is a figure from a video game, it's pretty fantastic. You get the same guns with added silver wear and tear, and that looks fantastic. As always the smaller blaster fits in the holster with no problems, and the guns fit in his hands just fine. 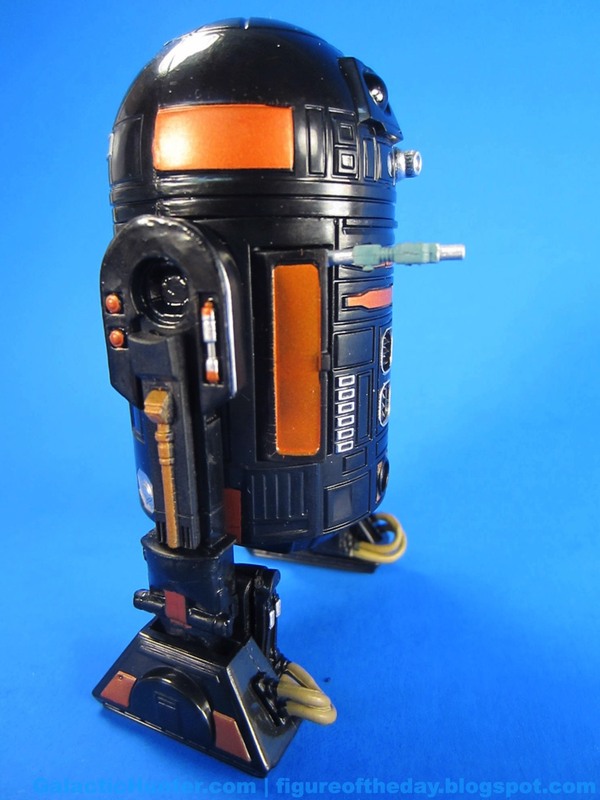 Repaints have to work with diminished expectations, and I would say that this is a good thing. 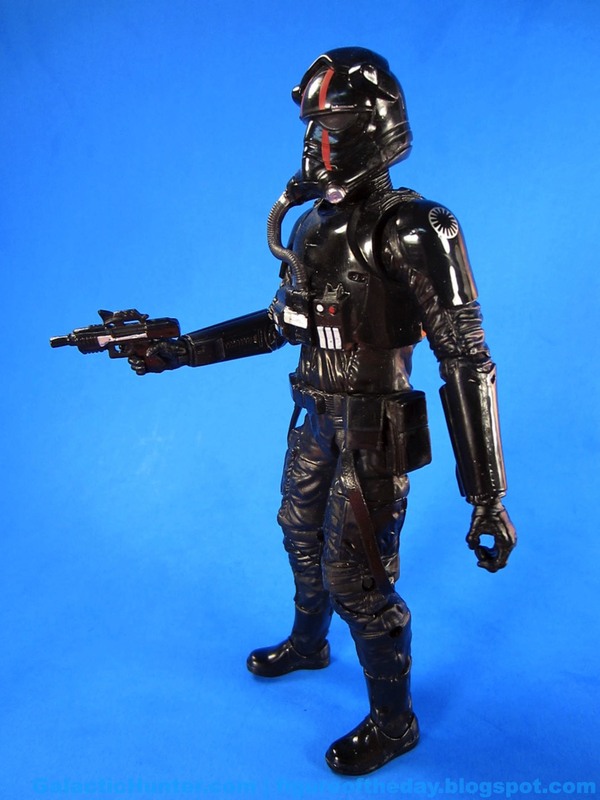 All Hasbro has to do is to deliver a figure that's as good as the exact same figure we got in the past, and they did. There are no real surprises here, as he has bend-and-swivel wrists and rocker ankles. The leg joints are a little stiff so it may take a few seconds to get them just-so to keep him standing, but it's not exactly a challenge. The figure is covered in Revenge of the Sith Shocktrooper-inspired red paint, with big stripes and bold blasts of crimson. There's more to it, though - not only does it have the typical markings and the new red ones, but the belt was decorated a quasi-canvas color. It's a little browner on the back, giving it a distinctive look. 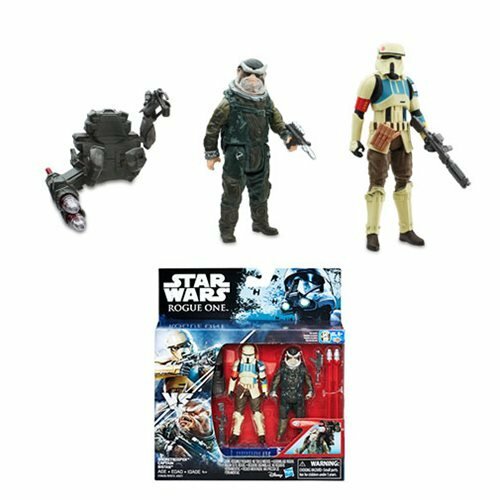 This is pretty important, as this figure is Stormtrooper/Sandtrooper #8 in this scale - and we've got 2 more coming before the year is up. 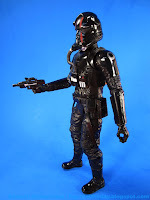 Heck, maybe more - Hasbro never formally announced this figure or most of its 2015 offerings, leading to the dubious benefit of reduced competition in aisles and a general feeling of being less informed, more likely to miss out, and in some cases a growing desire to let completism die. Nobody wins when they can't get the toys they want at suggested retail prices. At $1 below non-exclusive regular figures, this is probably the best 6-inch value of the year. Having not played the game - I only own a Wii U from the new console generation - I can't vouch for its on-screen accuracy. 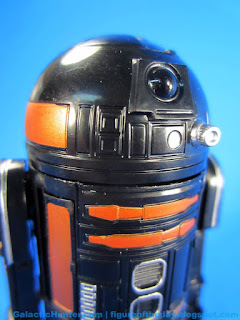 I can, however, say it delivers prequel markings on trilogy figures. Perhaps it's blasphemous, but I like it - there's only so much Hasbro can do to exploit its tooling library, and this is certainly more interesting than battle damage. It's also frustrating because here's yet another figure that exists in the 6-inch line that doesn't exist as a 3 3/4-inch figure. It is neat, though, but as with many of these figures this was bought out of habit as much as a hobby - I have zero emotional attachment to it other than that it looks cool. 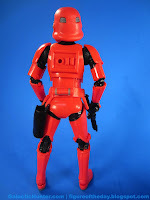 Part of me wishes the line launched with this figure, because it's really nice - clean paint lines, glossy red shoulders and lower legs, and it's just so pretty to look at. But now, in the context of a line of dozens of 6-inch figures, it struggles to stand out. Collector's Notes: I got mine at Walmart on November 16 during what ended up being a roughly 3-hour hunt. This is what happens when your wife leaves you alone for the night and you write about toys.